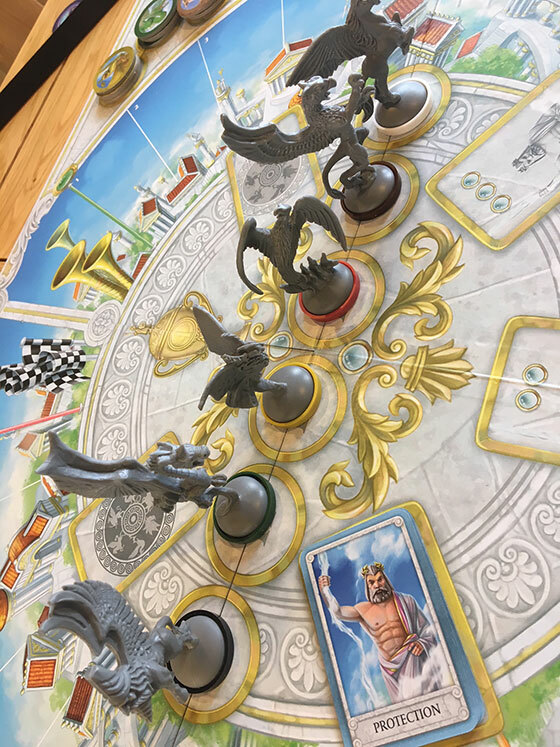 In Divinity Derby, up to six rival Gods amuse themselves by betting on the outcome of three consecutive races that take place between mythical creatures who race around an abstract, circular track. 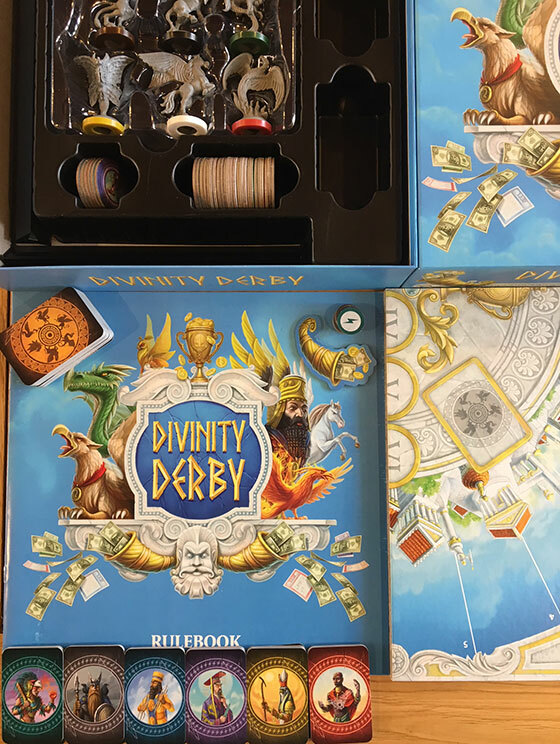 With beasts like a gryphon, a phoenix and a lamissu in play and the players representing Gods from numerous mythologies, Divinity Derby is a visual and thematic treat that is fast and fun. Whilst Divinity Derby is a game for three to six players, it’s worth noting that those players will each act as the God characters rather than the actual creatures. 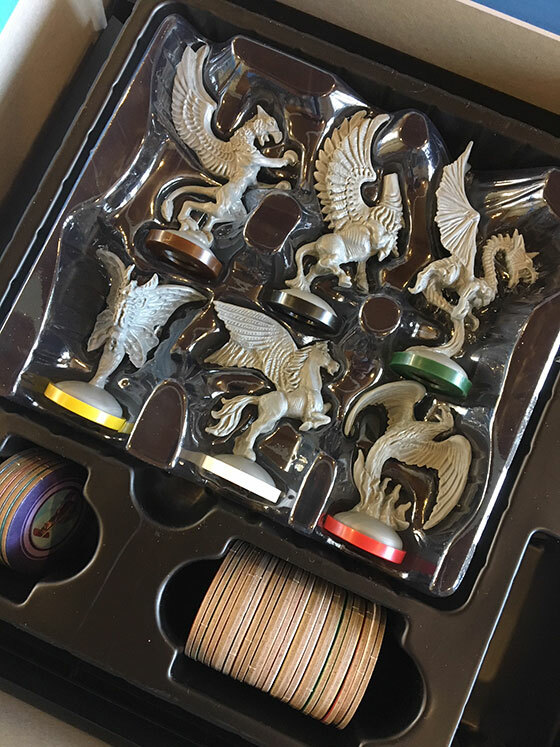 All six mythical beasts are therefore present in every race, regardless of the number of players and can therefore be betted on and moved accordingly. Whilst each game lasts for three full races, each actual race begins with the placement of two bets. Every God has a hand of eleven bets that feature different possible outcomes such as first place, first or second place, last place and disqualified. The first player reaches for a token associated with the creature they want to bet on, then places it on top of one of their bet cards, which is placed face down on the table. This process is repeated around the table until every player has placed two secret bets, at which point the race begins. It’s worth noting that depending on the player count, the number of bets that can be placed on each creature will vary, but in all races, it is impossible for every player to bet on the same creature. A third, final round of betting takes place when the first creature crosses the midpoint of the race, allowing players to potentially adjust their thinking based on how things have unfolded so far. It’s also worth noting that once a bet card is used, it is spent even in future races, so by the third bet of the third race, each player will have relatively few possible bets to choose from. Divinity Derby offers a very different experience based on the player count because of the conflicting bets and how creatures are moved. Which is via a rather interesting and unusual “shared hand” concept. 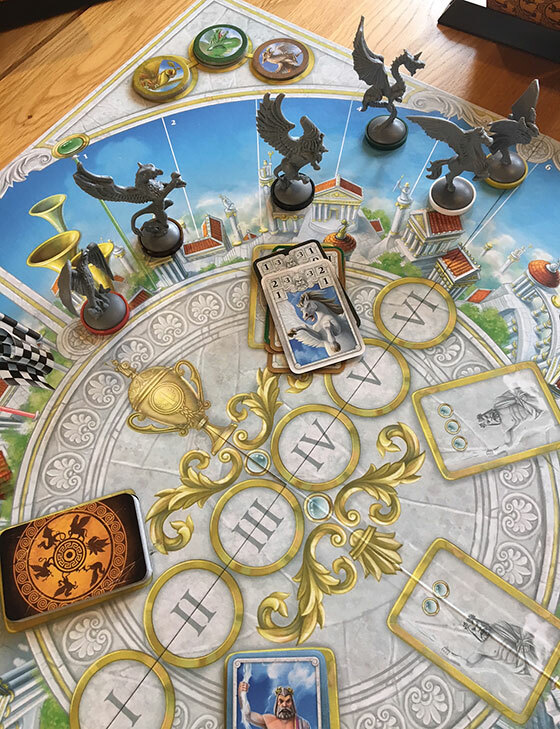 Each player in Divinity Derby should be positioned between two card stands, one to their right and one to their left, both of which they will have access to as the game progresses. The cards on each of these stands will show an image of the creature that they affect on the board, as well as a large number (the Fast Move) and a smaller one (the Slow Move.) Some cards also show an additional number, which is known as a Dirty Trick. At the beginning of each turn (beginning with the first player) each player takes one card from their left hand stand and one from the right hand stand to form a hand. 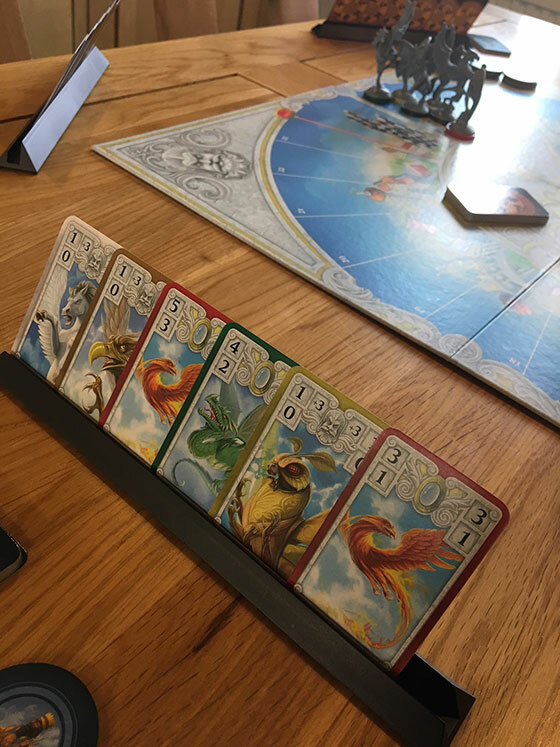 On each turn during the race, the current player uses one card to move the depicted creature based on the Fast Move value and one card to move the depicted creature based on the Slow Move value – it may be the same creature both times. Should the player have a card with a Dirty Trick value on it, then the speed boost shown can be added to the normal move of the creature, but if a player chooses that option, then he or she must add that movement card to the Zeus’s Judgement deck. When one creature crosses the finish line, the current round of movement is completed and the current standing on the board is considered the final position. 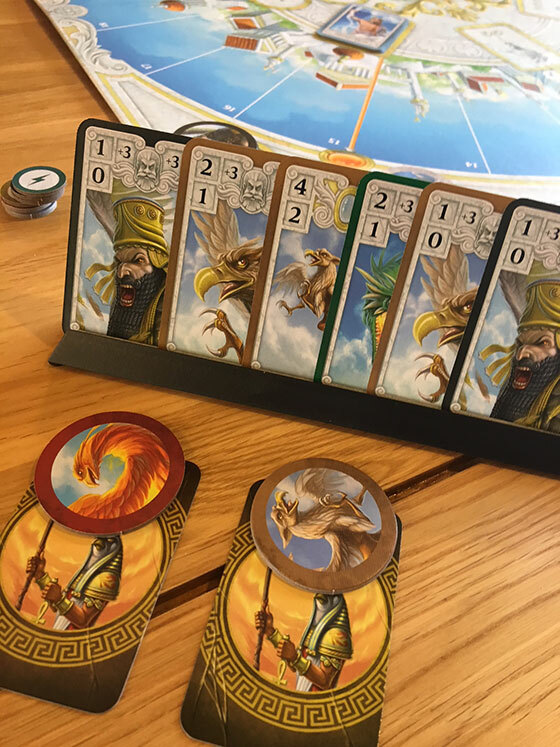 All creature miniatures are then moved to the central track in their final position, at which point two cards are drawn from the Zeus’s Judgement deck. Should any of the Dirty Trick cards be drawn, then that creature is immediately disqualified and any creatures placed behind it move up as relevant. At the end of the third race, all successful bets are totalled and the winner is the player with the most cumulative points scored across all their successful bets. For example, a successful first place bet is worth more points than a successful first or second place bet, because clearly it is a riskier play to make. There are even some alternate rules that introduce God powers to the mix, which is a subtle (but nonetheless worthwhile) way to change things for the better. The variance that is introduced with higher player counts can have a major effect on the decision making process in Divinity Derby, which is a feature that I welcome. On the flipside of that, the game really does need a minimum of three players to be viable and four, really, to offer its full potential. Whilst I played the game strictly in accordance with the standard rules, I am aware of a variant where players return unsuccessful bets to their pool, so only those that score in each race are removed. Overall this approach seems likely to make the game slightly easier, as it would allow players a second or even third chance to play riskier bets that they would otherwise have lost access to. Overall, I think Divinity Derby is a fantastic game. 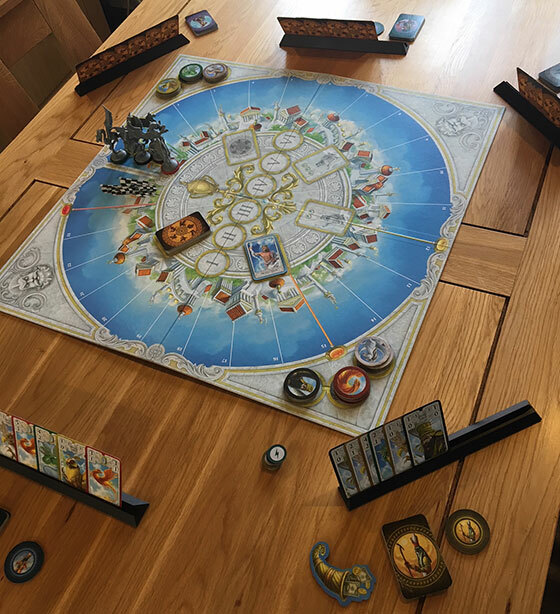 It has a beautifully made board and component set, with the six included miniatures being both large and well detailed. The God cards and associated artwork are all distinct and characterful, making it easy to tell the influences that draw from ancient Greece, Mesoamerica, Egypt and so on. The gameplay is also incredibly simple and yet very, very enjoyable. Divinity Derby is a fantastic game for players of almost all ages from about eight years old and upwards. In every game, I felt as if I had just enough control over my own destiny to feel invested in the game, but at the same time, each of my opponents was working continuously to undo my plan and keep me guessing. The shared information element of the dual hands plus the fact that every player can see who has bet on what creature is fantastic and means that everyone has access to about the same level of intelligence. It is certainly possible to plan counter strategies based on what can be seen, but at the same time, it takes a close eye to determine what outcome the other players actually want to reach for a given creature. 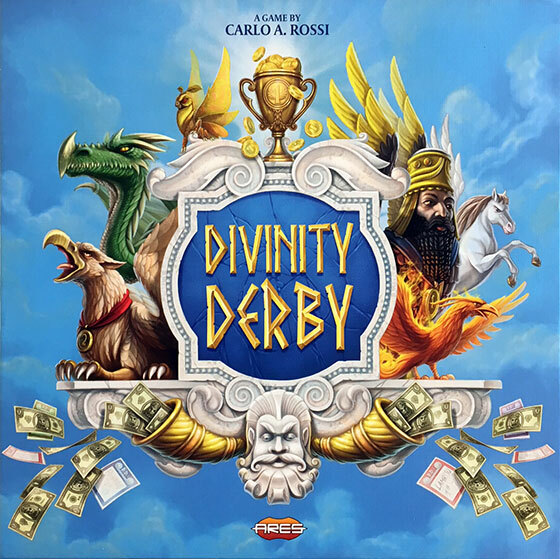 Ultimately, Divinity Derby is an exceptional addition to my collection and it stands alone as the only betting game of its kind. Whilst racing is a key feature, I would say that it is only a sub-genre of what is happening here at best, which is most definitely the betting aspect. By completely removing the concept of money from that betting system, I also consider the game suitable for players of most ages, assuming that they are capable of playing it. Very highly recommended. 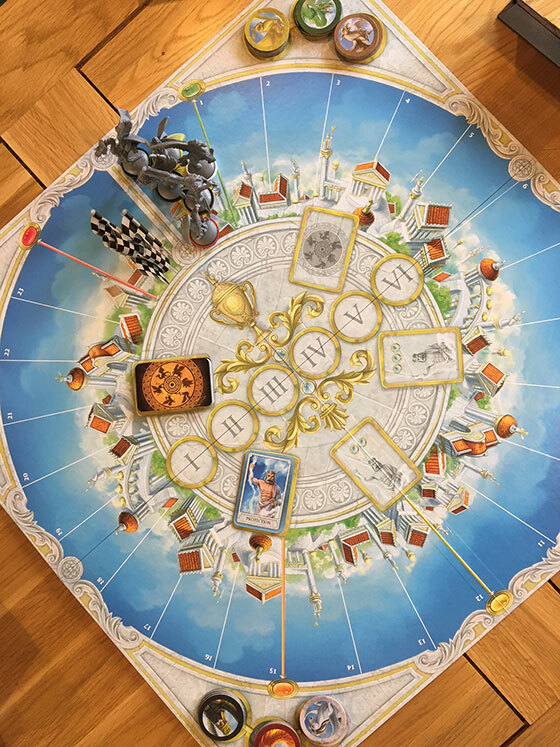 A copy of Divinity Derby was provided by Ares Games for review purposes. The game is now available in the UK and can be purchased at any friendly local game store.